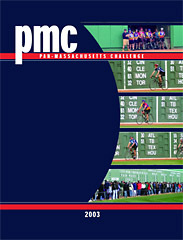 I wish I had a great story to relate about the 2003 Pan-Mass Challenge, but I'm afraid I don't. This year's ride wasn't especially kind to me, ending in a painful crash early on the morning of the second day of the two-day event. My ride ended in frustration when I went to the hospital to receive treatment for my injuries: abrasions all over my right side, a huge "road rash" on my right hip, and a puncture wound to my right elbow that required two stitches to close. What follows is a detailed account of the weekend. 2003 was my third year participating in the Pan-Mass Challenge, a two-day, 192-mile fundraising bike ride to benefit the Jimmy Fund and Boston's prestigious Dana-Farber Cancer Institute. The PMC is the largest and most successful athletic fundraiser in the nation, and brings in nearly half of the Jimmy Fund's annual revenue. 2003 was unique in that the PMC's total fundraising over its 24-year history would exceed $100 million. In addition, in 2003 the Boston Red Sox became the "presenting sponsor" for the event. This year the Red Sox celebrated their 50th year of affiliation with the Jimmy Fund, and working for the same charity made the connection between the Red Sox and the PMC a natural one. My preparation for this year's ride began the week after Thanksgiving, when I got back onto the bike after a six-week hiatus due to my first bout with pre-patellar bursitis. Over the next eight months, I would ride more than 2100 miles, spending nearly 150 hours on my bike. I rode more than 100 miles per week in ten of the last eleven weeks before the PMC, which took place August 2 and 3. There were several interesting rides during my training. In February, I made nearly a dozen trips out to Malden to cat-sit for my friend Jeanie, who spent the month in New Zealand; during that time Boston received 20- and 27-inch snowfalls, the latter eclipsing the infamous Blizzard of '78 as the greatest snowfall Boston has ever received since records began being kept over a century ago. Biking through that was no small challenge! This spring I tried to focus my training on hills, and climbed Boston's Great Blue Hill access road for the first time. I also cycled the 1500-foot pass at Evans Notch in Maine's White Mountains, and rode to the 2008-foot summit of Mount Wachusett, the tallest mountain in eastern Massachusetts. I really enjoyed those accomplishments. Fundraising has been a very mixed bag. This year's minimum fundraising requirement was raised from $2000 to $2500, and at the time of the ride, I had raised $1950. So as the ride began, I still needed to raise another $550 before the end of October. One of the fun parts of fundraising was that in one of my graphic design classes this year I was able to create a poster soliciting sponsorship for my ride. Although copies of the poster were put up throughout my condominium and at Jeanie's workplace, the posters didn't produce so much as a single inquiry, much less any contributions. Similarly ineffective were corresponding business cards that I designed, and a heartfelt plea sent out to family and friends by another close friend of mine. So fundraising was probably the first frustration for me in this year's ride. Friday, the day before the ride, I woke to pouring rain, and the weekend forecast was for rain Saturday, and periods of showers on Sunday. As I did my final packing, I recalled that it has rained the day before the ride for each of the three times I've participated. The weather looked like it was liable to be another source of frustration for me. For the third year in a row, my close friend Jeanie provided me with transportation to and from the event. She picked me up and we left Boston and headed for the Sturbridge start at 1:30pm. I quickly checked into the event at ride headquarters at 3pm, and then we went on to the hotel. An early dinner was a barbecued pork sandwich at the Picadilly Pub. Afterward, we returned to the hotel in pouring rain and watched the ride's opening ceremonies, which were cablecast on the New England Cable News channel. I woke up at 3:30 in the morning and couldn't get back to sleep. The rain had stopped briefly, but it resumed in earnest again before Jeanie and I got up at 4:45. We loaded up, checked out, and got me and my bike over to the start. Although I hadn't brought a rain jacket, it was pouring hard enough that I accepted a light slicker from Jeanie. As I went to top off the air in my tires, the locking nut on the Presta valve on one of my inner tubes came off in my hand. Since the tube was still holding air, at that point I had a choice of either replacing my inner tube then and there (and probably starting the event late), or hoping that the tube would stay sealed without its locking nut. I gingerly left the tire alone and hoped it would see me through. Another difficulty! After pumping up my rear tire, I said goodbye to Jeanie and lined up for the start. The rain was starting to lighten a little as the PA system crackled with the seemingly inappropriate Who song "Teenage Wasteland". A few minutes later, about 2200 riders set off at 5:56am. On the way out, Jeanie somehow managed to pick me out of the immense crowd of riders and called my name; I was glad that this year she'd decided to stay and watch the start, which is quite an impressive display. I hadn't stretched before starting, but the first few miles are always pretty easy, while everyone finds their legs and the vast crowd thins out. This year was slowed even more thanks to the rain and standing water everywhere. I smirked at one guy riding a $3000 bicycle, but whose rain gear consisted of a plastic Dunkin Donuts bag worn as a poncho. An hour later, twenty miles into the ride, we came to the first rest stop in Sutton. One of my goals was to try and beat last year's time, and one of the strategies I was going to use was to minimize how much time I spent at water stops. That would also get me into Bourne earlier, so that I wouldn't have to wait too long for a massage table. It still being very early in the ride, I decided to blow right past the first stop and keep on going. The next leg took us by Purgatory Chasm, one of my favorite spots, both because of the granite fells there, as well as the longest downhill of the ride. I'd been anticipating for this, and despite the wet roads I did my best to break my old land speed record. Last year I'd hit 41.4 MPH, but since then I'd hit 42.7 on my Evans Notch trip, and 43.2 on the way back from Mt. Wachusett. I got the speedometer up to 44.9, a new record, but no matter how hard I pushed, I couldn't get that last tenth to turn over to 45 MPH. I pulled into the so-called "lunch" stop at 9:40am, 60 miles into the ride, where we merged with another 1400 riders who had started in Wellesley. I stretched, grabbed some Gatorade and a few pickles, but was back on the bike in fifteen minutes. Despite my training, the hills were causing me more difficulty this year, and my neck was aching quite sharply. That pain was even more acute in Lakeville, the 85-mile point, after a particularly long haul between water stops, so I took some extra time in stretching before moving on. It was 11:15, and I had just two more short legs to go! But it was approaching the 100-mile checkpoint in Wareham that I began getting discouraged. The rain and little misfortunes had gotten to me, and the pain in my neck continued to get worse. However, as I sat in a folding chair at the rest stop, an old man next to me told me about his 65 year-old son-in-law, who was riding a month and a half after surgery on his achilles, and his 42 year-old daughter and mother of four; they were both riding for the tenth year. The story of their persistence inspired me to get back on the bike and persevere through the last few miles. The last leg turned south, directly into a very strong wind off Buzzards Bay. Still, the end was within reach, and I finally pulled into Mass Maritime Academy in Bourne with my odometer at 110.89 miles at a 17 MPH average speed. At 1:17pm my cyclometer said I'd spent just over 7 hours in the saddle, but due to rest stops the clock time was closer to 7:20. Between the rain and the increased difficulty I had with the hills, I certainly didn't break the previous year's record, even though I arrived at MMA more than an hour earlier (remember last year's hour delay due to the accident). At MMA I wasted no time getting my luggage, having my shower, changing into the next day's cycling clothes, calling Jeanie to let her know I'd arrived, and signing up for a massage. I had arrived and showered early enough that my massage was scheduled for 2pm, the very next round, when last year I'd had to wait until 5:30! I barely had time to grab a bottle of water before my turn came. The massage definitely did a wonderful job of relaxing my aching neck muscles. After that, I was free to wander over to the food tent, where I downed two cheeseburgers, a hot dog, and two ears of corn. Typically there's a guy giving out cups of ice cream, but one of the volunteers told me that he'd only brought 500, and had run out and gone home already! Frustrated, I grabbed two more ears of corn and went and sat by the windward edge of the bay. The weather had become a mix of heavy overcast and occasional sun, accompanied by a strong wind. After resting for a bit, I walked the shoreline along the bay, and then up the edge of the Cape Cod Canal, which was flowing quite strongly. Although the day had begun horribly, it ended fairly nice, and it was pleasant and restful after a long ride. However, I started getting bored and wanted to get to my hotel, so I left MMA at 4:30pm and headed off on my own to the Bourne Bridge to cross the canal onto Cape Cod. Many people stay at MMA, and they get to enjoy the sunrise while riding over the bridge in the morning, but with all the commotion MMA isn't a very restful place, and I prefer having my own room in a hotel. Although I miss out on the sunrise, I get to enjoy the sunset the evening before, looking back at the bridge from a cool, quiet, leisurely ride along the canal's bike path. It adds another 10-12 miles onto my day's ride, but that's also 10-12 miles less that I have to ride on Sunday, and I get the benefit of perhaps an extra hour's sleep, and that's well worth it! I got to the Sandwich Motor Lodge at 5:15pm, after a total day's ride of 121 miles. There I showered and made some Gatorade for the next day's ride while watching the weather report and the limited coverage of the ride on NECN. The next morning I was up at 5:30am; the weather was very foggy and humid, but otherwise okay. I immediately noticed that my rear tire was flat, which confirmed a suspicion I'd felt coming off the Bourne Bridge the night before. Although the valve problem had been on my front tire, apparently the rear had now developed a slow leak as a result of some glass I'd encountered on Saturday's ride, and I had to once more decide whether to replace a tube now, or ride with it and see whether it would hold air long enough to get me from one rest stop to the next. In the end, I decided to risk it, and began pumping up the tire with my frame pump. Unfortunately, while I was pumping, the spring-loaded mechanism in the handle triggered, sending the plastic handle flying into my right hand, cutting my ring finger. It, plus the stiffness I felt that morning, added another couple points to the frustration that I felt. I checked out, bandaged my finger, and pulled out of the hotel at 6:08, quickly joining up with a large number of riders on the ride route. We traversed a bunch of rolling hills, and by the time I pulled into the Barnstable rest stop at Cape Cod Community College, 13 miles later, I was making my best speed of the ride so far. Although my tire appeared to be holding air well enough, I hadn't been able to fully pressurize it with my little hand pump, so I went directly to the mechanical tent. While waiting in line to use their floor pump to top it off, I overheard someone talking about a crash, and I recalled seeing another one on the side of the road. I pumped my tire pressure up rather high, which may have been a contributing factor in what followed (in that the higher the tire pressure, the less contact it has with the road surface). I left Cape Cod Community College at 7:06 and quickly turned down Route 6A. On a long downhill, fifteen miles into the day's ride, I tried to latch onto the end of a paceline that had just gone by me. As I got in behind her, the woman at the back of the paceline got onto her brakes and hit a large pothole. No one in the front had signaled its presence, and before I could react at all, I hit it at full tilt and began to lose control. I got on the brakes, and with the road slick from the humidity and fog, my rear tire locked up and went out from under me, dumping me hard onto the pavement on my right side, where I skidded and rolled. Before taking any inventory of my injuries, I immediately rolled to my feet and got myself and my bike off the road surface and out of the way of the cyclists directly behind me, who were yelling "Rider down!" to alert those behind them. Then I began taking stock of the damage. The most painful injury was my elbow, which had a dime-sized hole in almost the same location where I'd had stitches before, after a childhood bicycle crash some 25 years ago. I looked up to see that four riders had stopped to assist me, and I asked them to help me determine where I was hurt other than my elbow. The other major injury was a huge road rash on my hip, but I appeared to have no broken bones nor any head injury. But the ride I'd spent all year preparing for was over, 55 miles short of the finish. One of the riders who had stopped said he was a physician, so I waved the others to continue while he and I debated whether I needed to go to the hospital and get stitches or not. I looked at him, sighed, and said "I guess I'd better call them to pick me up, eh?" But just as I said this, he began gesturing, having seen one of the PMC vans that regularly patrol the ride route. The doc bundled my bike onto the van's bike rack while I talked to the driver. I thanked the doc and climbed into the van, which would bring me the short mile and a half back to the rest stop at Cape Cod Community College. The driver left me and my bike at the entrance, and I walked my bike over to the medical tent and asked for triage. The tech there did a preliminary binding and we discussed my options. Like the rider physician, the LPN asked if I wanted to continue the ride, but also seemed to think that going to the emergency room was the wisest choice. I agreed, and it wasn't long before an ambulance arrived. Apparently they'd already requested transport for a woman who had fallen and had a head injury, and she and I shared the ambulance. Her state wasn't improved by the fact that we were legally required to be strapped down and wear neck braces for the ambulance ride. Surprisingly, I got fairly quick service at the hospital, which I later found out was Cape Cod Hospital in Hyannis. We took inventory of my injuries, which included a puncture wound to the side of my forefoot, abraisons to my ankle and knee, a huge road rash on my hip, a bruise and small abraison on my back, and a big abraison, bruise, and puncture wound on my elbow, all on my right side. I received a tetanus shot, they cut me out of my ruined month-old $135 Italian cycling shorts, and my wounds were cleaned and dressed. It appears that because the roads had been washed clear by the rain and made slick by the morning fog, my wounds were surprisingly clean, and only required irrigation; the memories of the scrub brush they'd used on my elbow 25 years before had been in the back of my mind all morning. My elbow required two stitches to close. Apparently the head injury woman and I were two of only four riders to be sent to the hospital on Sunday, and all the (19) incidents throughout the weekend that had required hospitalizations occurred during the first three hours of each morning's ride. I was released at 10am, and synched up with the husband of the woman who had come in with me. They had called the PMC, who were providing a shuttle to bring them on to Provincetown. I'd already called Jeanie, and she'd taken it upon herself to come down and try to find me, even though she had no idea what hospital I was in. When I was released, I called her and discovered that she was at a hospital in Yarmouth, and gave her the address of my location. Some time later, she picked me up and we drove up to Provincetown. Although I would have finished the ride about 10:15am, at noon we drove by a number of riders who were still on the road. I was feeling frustrated and petulant, blaming everyone and everything for the foul luck that had plagued me the entire weekend. As always, Jeanie was patient and helpful, but even more so after my crash. Every year she has been there to get me to and from the ride, and has been available with whatever help I needed. Her support has been tremendous, and is very deeply appreciated. Upon reaching Provincetown, we went straight to the finish line, where I picked up my luggage and we found my bike, which had been transported up from the rest stop in Barnstable, then we went and rested a bit at the hotel while I slowly came back down from my moodiness. That afternoon we wandered around Provincetown and had dinner at a fairly nice place, where my fortunes were underscored when the woman at the table next to us dropped her knife onto my injured right foot. Even as I walked down Commercial Street, a cop accosted me, pointing at the bottle of root beer in my hand and demanding, "That's not a beer, is it?" I'd suffered mechanical failures, been rained on, biked 140 miles, crashed, been injured and hospitalized, and given up my year-long ambition, and now this. I felt frustrated, disappointed, and thoroughly beat up. One might well ask whether my crash has soured me on the event. At this point, I can't say whether I will or will not be back for next year's Pan-Mass Challenge. Obviously, I seem to have an ongoing string of bad luck with this event. There are certainly other long-distance rides I could do, but I firmly believe that cancer research and prevention is by far the most worthy cause out there, and riding in the PMC is the best way for me to contribute to that cause. I've given a great deal of time, effort, energy, and strength to this event, and I will only participate so long as I think I am able to succeed at it. Of course, the real measure of success isn't the ride itself, but the fundraising, which has also been a challenge this year due to the increased minimum. My decision about next year's ride will depend on my ability to raise the minimum donations much more than on memories of any accident or string of bad luck. sat Bourne 1:17 pm 4:27 pm 6:29:23 110.9 17.1 44.9 Arrival at MMA!